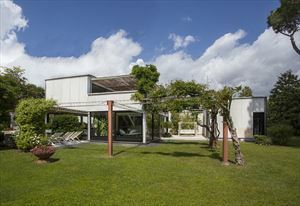 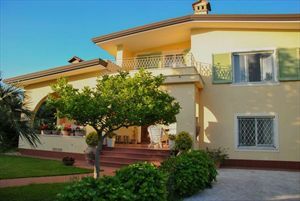 A charming detached villa (180 m2) with a cozy garden (900 m2) is situated in a quiet green area of ​​Forte dei Marmi (zone Caranna) about 1000 meters from the sea. 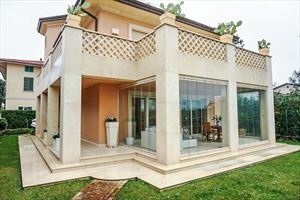 The ground floor features two terraces with outdoor furniture, living room with dining table, bathroom with shower, kitchen with dining area and an independent access to the terrace. 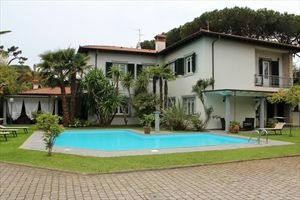 The upper floor comprises a bedroom with twin beds, double bedroom, both have balconies; bathroom with bath. 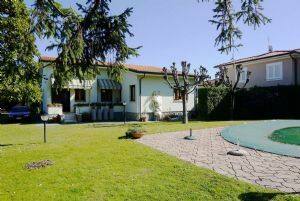 The basement consists of a living room with fireplace and dining table, bedroom with twin beds, double bedroom with a small bathroom, laundry. 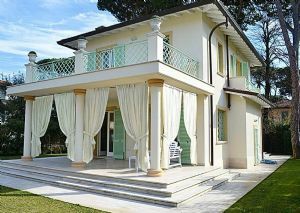 The villa is equipped with alarm system, air conditioning, satellite TV, Wi-Fi, automatic gates, barbecue. 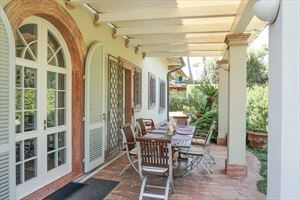 In the garden, there is a gazebo and a covered parking for 2 cars.